1. Preheat oven to 425F. Line a large baking sheet with foil or parchment paper. Starting at one end of a cheesestick, carefully wrap one strip of bacon around it, overlapping bacon halfway each time to help secure the bacon in place. Because the bacon is precooked it will be a little harder to wrap, but the light pink and fat portions should still be pretty flexible. When you reach the end of your bacon, tuck the end into one of the folds to keep it from unwrapping. 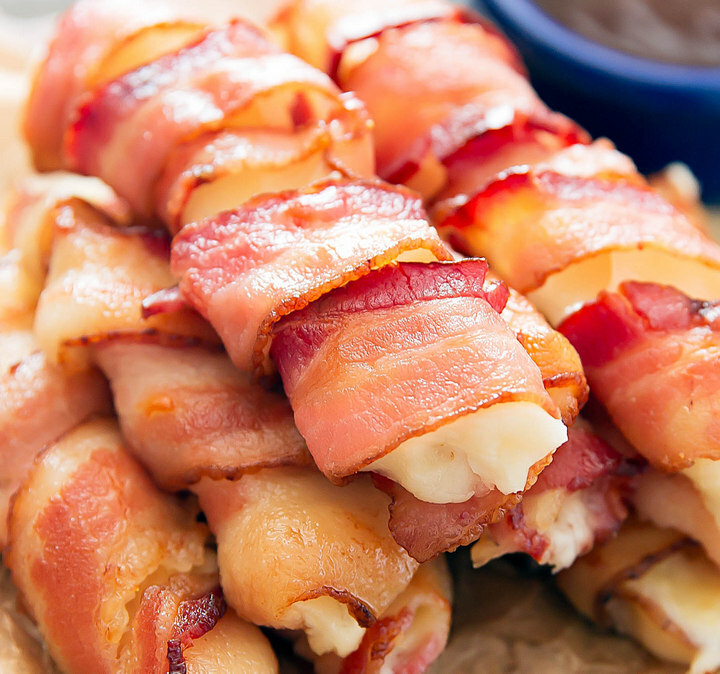 Repeat with 1-2 more strips of bacon until your cheese is completely covered, including ends of cheese. 2. Place finished wrapped cheese stick on baking sheet. Repeat with remaining cheese and bacon. Bake in oven for about 6-10 minutes, or until bacon is crisp and before cheese completely loses its form.